Here’s what’s happening in the world of television for Friday, January 5, and Saturday, January 6. All times are Eastern. Time I had some time alone. Crazy Ex-Girlfriend (Friday, The CW, 8 p.m.): We have mentioned more than a few times how much CEG is killing its mental-health theme this season, so we eagerly welcome it back after its winter break. And we look forward to Allison’s Shoemaker’s always-expert take on the episode with equal eagerness. 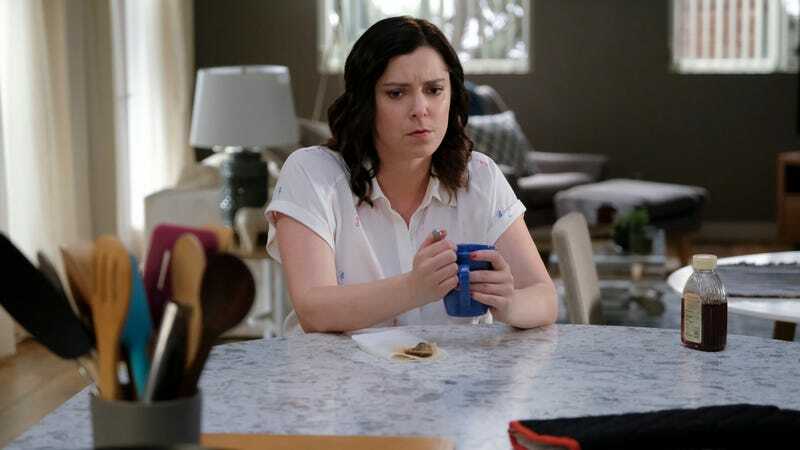 With “Nathaniel Needs My Help!”, it looks like Rebecca (Rachel Bloom) has a new focus after her considerable break from Josh Chan (Vincent Rodriguez III); hopefully this is progress and not backsliding, Rebecca! The End Of The Fxxxing World (Netflix, Friday): Not to put too fine a point on it, but this British series couldn’t be more appropriately named, could it? Netflix brings us the offbeat romance of youngsters James (Alex Lawther), who’s likely a psychopath, and Alyssa (Jessica Barden), who he’s going to fall in love with and/or kill. The two steal his dad’s car and go on the lam, making for a much cuter criminal road trip than Natural Born Killers. But if the series is so dark, what’s with the strummy Wes Anderson-esque soundtrack? And most importantly, how is it so very funny? Our immediate verdict: confusing, but riveting.